Imagine having your Lake Tahoe wedding on a bluff over Emerald Bay at sunrise, atop a snow-capped mountain at sunset, or lakeside on a beautiful beach surrounded by majestic Sierra Nevada Mountain views. Imagine celebrating a very special day in your life in one of the most beautiful places in the world. With striking natural surroundings, Lake Tahoe weddings have an allure beyond comparison, providing a magical and enchanting setting for your once in a lifetime event. What better way imaginable can newlyweds began their marriage and new life together? 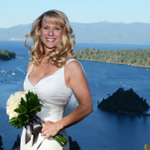 Have the wedding of your dreams and explore the possibilities of what a beautiful Tahoe wedding has to offer. Bordering two states at an altitude of 6,220 feet in the heart of the Sierra Nevada Mountains lies an incredible and magical place that’s home to the largest alpine lake in North America. 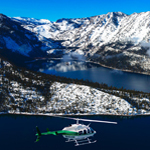 With its magnificent scenery of towering peaks, pristine blue waters and remarkable scenic views, the south shore of Lake Tahoe makes a spectacular destination wedding hotspot. 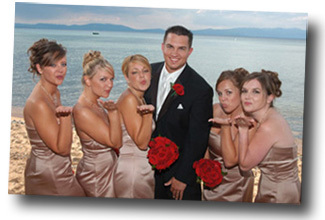 View weddings in Lake Tahoe at actual locations around the lake! Living a Dream in Tahoe! Tahoe weddings take place year-round at various outdoor locations around the lake, each providing an atmosphere of alpine ambiance. We offer affordable weddings with affluent views at many of our available ceremony venues, and any wedding package that you choose can be customized to fit your budget or specific needs. Let our professional staff at Alpenglow Weddings assist you with arranging the wedding you always dreamed of at the venue of your choice. Geared with expertise and many resources, our staff will help to remove the stress from your special day by attending to every detail of your nuptial celebration. With years of experience in helping brides and grooms with their wedding needs, rest assured we can plan the perfect day for you. 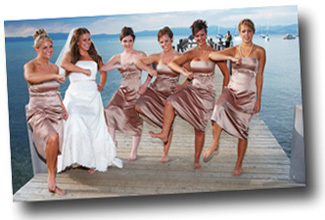 Visit a few popular Tahoe venues frequently selected by brides and grooms! Even with the simplest solemnization, our helpful staff will view it as one of the more lavish. We’ll provide all the essentials tailored to your specific needs and budget including a professional minister, an outdoor ceremony venue of your choice, a photographer, marriage license, flowers, and all other ceremony necessities. After all, it is your special day, and our aim is to make it a memorable one. As your guide to a beautiful day, take our tour around the lake. 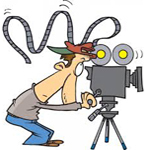 See what we’re planning for you! Have questions? 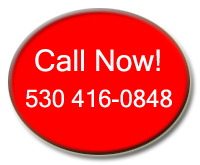 Give us a call or visit our Frequently Asked Questions page.